Do you want to see Kindness spread? Let’s do it together! We are looking for kind individuals (and groups!) who care about making the world happier, more connected and loved through simple acts of kindness. Do you enjoy making people smile, creating connections, and making a difference? Join us! Sign up to tell us you are in! It’s Free! Spin kindness individually, in your own way, and tap into our resources of ideas, inspiration, printables, and Spin Kindness cards. Follow the Daily Acts of Kindness, or be an example of kindness in your own way. Sign up so we can keep in touch, send you some kindness, and share the great things you and others are doing. Do you enjoy bigger events or spreading kindness along with others on the same mission? Are you interested in receiving supplies to help you spread kindness? 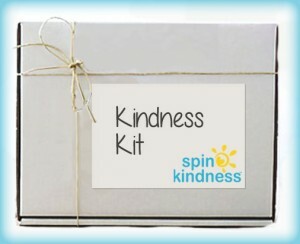 Be the first to hear about sponsored events and receive free kindness kits by registering now. Have you experienced the joy of paying for the cup of coffee or bridge toll for the person in the car behind you? Do you get giddy when you add coins to an expired meter for a stranger? Are you the first to greet new neighbors or to contribute a casserole to a family in need? If so, we want to equip you with lots of resources (and even free products!) so you can give even more.